A sample from the novel, Wasn't Supposed To Love Her. The book is available now. Enjoy! Royce released a frustrated breath. At some point, he’d tell her who he really was – that he was part of a task force of CIA agents, Feds and a few ex-army soldiers in a new underground effort to combat human trafficking. 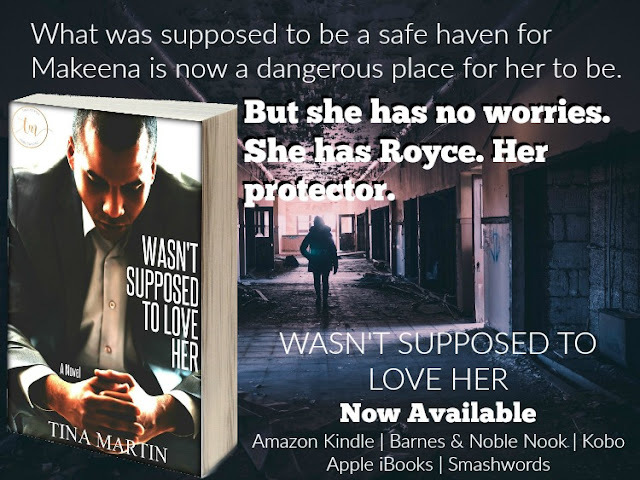 He had no intentions of hurting her, making her a slave or forcing her to sleep with him. He did however, need to lay down some ground rules – something that proved difficult to do since she’d been sleeping the better part of the seventy-two hours she’d spent at his house thus far. By some miracle, she was awake, standing in the kitchen, back still to him even after he’d asked her a question. Little did she know that was a pet peeve of his. He hated it when someone intentionally ignored him. Makeena turned around this time and looked at him with intense eyes. The glow in them, the strength of her gaze made him question her mood. One would think an ex-soldier could read body language and facial expressions well. Something about her expression threw him off balance. “Do you talk?” he asked. “Yes. I talk,” she said, her voice as sweet as honeysuckle. “So…” She crossed her arms. Cute, Royce thought. Who did she think she was intimidating with crossed arms? “So, what?” Royce heard himself asking. A frown cemented on his face. “Your ring?” he asked. None of the others asked him for a ring. She, on the other hand, had like she was ready for this. Ready to be someone’s wife like they were entering into some sort of arranged marriage. “I don’t have a ring for you,” Royce responded. He wanted to tell her she wouldn’t get one with this not being a legit marriage and all. It was just an undercover sting – marriage on paper so the bad guys didn’t suspect anything. Royce narrowed his eyes at her. She had to have known that fact. How could she not know that Gertrude was selling off her foster kids one-by-one as soon as they were of age, for a thousand dollars a pop? “So what are they?” she asked.